How do I connect using the built in Radius server? What is my default Login and Password? Wireless LANs – Are They Safe? If the support information in this section doesn't help you solve your issue, you can contact a USRobotics Help Desk Technician directly. Note: In order to prevent your browser from trying to open these files, right-click the file and select Save Target As... to download. Download this file to a temporary location on your computer's hard disk drive. To upgrade your Professional Access Point with all operating systems, open an Internet browser and enter the access point's IP address. Note: If you do not know your access points IP address, follow the instructions described in the Quick Installation Guide. By default the IP address of the access point is 192.168.1.10. Enter your User name and Password. Click OK.
Navigate to Advanced menu’s Upgrade tab. If you know the path to the New Firmware Image file, enter it in the textbox. Otherwise, click the Browse button and locate the firmware image file. Click Update to apply new firmware image. A confirmation window describes the upgrade process. Click OK to confirm the upgrade and start the process. When the upgrade is complete the Web User Interface redisplays the Upgrade firmware page. This will extract the Professional Access Point Detection Utility for the USR5453 to c:\KickStart. 56K with V.92 Technology Upgrade your 56K modem to latest V.92 technology. International Contacts Find information on your country or region. 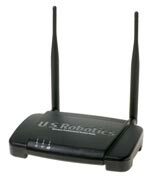 Warranty Registration Activate your USRobotics product warranty online.